We’re all dreaming of a white Christmas and you’ll find one in Morzine this year! With more than 30 cm of snow coming this week the 17/18 season is proving to be one of the earliest we have had in 5 years! If you’ve booked to stay in one of our self catered chalets this Christmas and New Year, most of your Morzine ski holiday will be spent up on the mountains. But be sure to check out what else there is on offer, as Morzine gets fully into the Christmas spirit! If you can get away over Christmas Elevation have a some availability left. We are happy to do short breaks and smaller groups than normal at this late stage. Its easy to get a quote. just contact us via the enquiry form, email (info@elevationalps.com) or by phone. We will get back to you well within 24 hours. Getting back to whats going on in Morzine at Christmas…. Treat the kids to a very special trip down to Les Gets on Christmas week, where they can fully explore Santa’s grotto, meet his Elves and even Santa himself! From Saturday 23rd until Friday 29th December, Santa will be found down in the Enchanted Forest in his Grotto, greeting kids of all ages and giving the gift of Christmas. His Log Cabin will be open from 9am till 9pm daily. To get there catch the Les Gets Petit Train and stay on until you get to the Les Gets lac (its opposite a primary school). Then walk up through the woods. Call in at the Les Gets Tourist Info office if you are unsure. The Catholic Church in Morzine welcomes Rev. Stephen Coffin to celebrate with them on December 21st, with an English Christmas service starting at 6pm. Your family can look forward to plenty of traditional Christmas carols, a service of Bible readings, all followed by mince pies and mulled wine. Christmas Eve is when the French typically celebrate their Christmas: gift giving and even the traditional Christmas meal takes place for most French families on Christmas Eve, so you can be sure that there is plenty going on in town on the 24th December. An abundance of activities will be happening down at the Tourism Office from mid afternoon onwards. Starting at 3:30pm and lasting until 6:30pm, if your kids feel like getting creative they can indulge in paintbrushes, colours and all things sequins with Face Painting events, both Christmas Eve and Christmas Day. For 2€ per child, register down at the Tourism Office. This winter, Morzine will be illuminating its 3m-high, Candle-made Christmas tree in the square behind the Tourism Office. Starting the illumination at 4pm, it will be worth sticking around for a few hours, as Santa Claus makes his farewell from the balconies of the Tourism Office from 6pm. It’s free access to the square, where Airstar will be bringing the celebrations to life with the illumination of the Festive lights, lighting up the centre of Morzine from 6pm to 7pm. 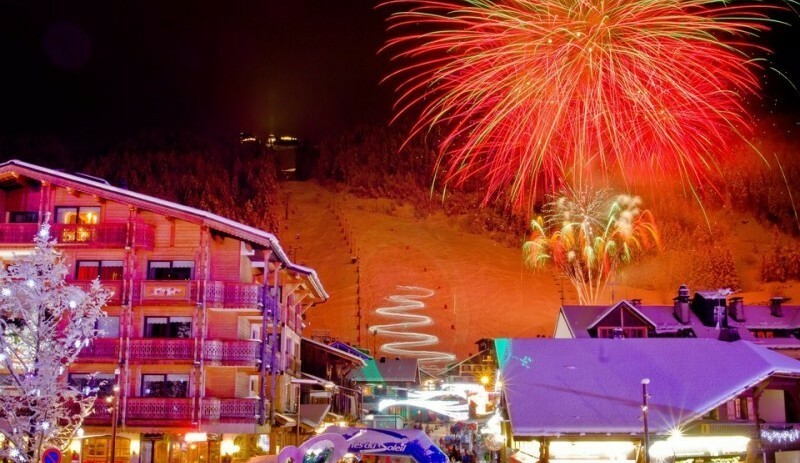 If that isn’t enough for you and the family, you’ll find yourselves in the perfect location to watch the fireworks display too: they will be launched from the Pleney slopes so that they are seen and heard across all of Morzine, starting at 6pm. Christmas Day brings with it a whole new agenda of celebrations. After you’ve spent the morning in your self catered chalet, giving gifts and making the most of family time before the traditional Christmas Day ski, get yourselves back down to the Tourism Office. From 2:30pm until 6pm, there’s a spectacular array of Parades taking place to entertain all of the family, with free access to everyone. Between 4pm and 5:30pm, the Tourism Office will also be offering free hot chocolate for the children, and Pitch, a typical French snack of a brioche-esque bun, filled with a chocolate/hazelnut filling. La Grange: Offering a French twist or a traditional take on the Christmas meal, La Grange will be serving up a choice of starter, main and dessert on Christmas Eve and Christmas Day. You will need to book a table and also pay for the meal in advance. 40€ per adult, and 20€ per child (drinks not included). If you prefer to eat in your self catered chalet, they even offer a “takeaway” version! From 35€ per adult and 15€ for a child, you can order your Christmas dinner in advance and pick it up from La Grange (offering dinner on Christmas Eve, or menus for both lunch and dinner on Christmas Day). La Chanterelle: Fancy a trip out of Morzine for your Christmas meal? Read our Restaurant Review on La Chanterelle: you can be guaranteed the most spectacular views to accompany a delicious menu! Le Clin d’Oeil: Serving both Christmas Eve dinner and lunch/dinner on Christmas Day, Le Clin d’Oeil offers a set menu at 36€ per adult and 22€ per child. With their normal menu available too, you can be guaranteed a delicious meal with a super festive feel: rumour has it that Santa will be handing out baubles of chocolate and booze on the night, so don’t forget to book your table! L’Aubergade: Located in the centre of Morzine, you’ll be certain to come across their restaurant on your stay, with a sprawling terrace that you can ski straight down to and comfy sofas from which you can watch the kids playing on sleds, whilst sipping a tasty mug of hot chocolate. They are incredibly popular for their Sunday roasts, which sell out quickly, so are guaranteed to offer an exceptionally tasty Christmas meal. Don’t fret, the celebrations aren’t over yet! The Morzine Boxing Day parades are definitely worth a watch, with colourful lights and festive music filling the Tourism Office square from 4:15pm until 6:15pm. The Palais des Sports also offers a free Creative Workshop for the kids on Boxing Day: an hour and a half of creating Christmas garlands, making mobiles and designing Christmas cards from 2:30pm.